Twitter has 310 million active users on its platform and is viewed by many as a quick way to engage with real-time news, or, on the content creator side of the service, to connect with an audience. The company recently announced various enhancements to its service but the latest addition gives the impression Twitter desires to attract a younger audience in an effort to compete directly with social media platforms like Snapchat and Facebook. In the coming weeks, Twitter has plans to bring “Stickers” to its users, which the company notes is “a fun new way to add creativity to your photos and connect them to the world on Twitter.” Stickers are to to launch on Android and iOS at some point in the near future, according to Twitter. Desktop users will be limited to only being able to view and click on stickers. Stickers are accessed inside Twitter’s photo editing section, which includes a library accessories, props, filters, tags, cartoons, images, and emojis, all available to add to images. Users are able to place multiple stickers on photos and they can also be resized and rotated. “After you Tweet a photo with stickers on it, your photo becomes searchable in a new, visual spin on the hashtag. Tapping on a sticker in a Tweet takes you to a new timeline, where you can see how people all over the world use that sticker in different ways,” said Twitter in a statement sent to MobileSyrup. “For many users, photo sharing is a big part of the Twitter experience and stickers will help bring new layers of fun to the photos they upload,” said Rory Capern, managing director for Twitter Canada. There is no indication yet if Twitter will monetize Stickers with themes packs or via promotional events, which includes its recent foray into sports with through its recent NFL contract. 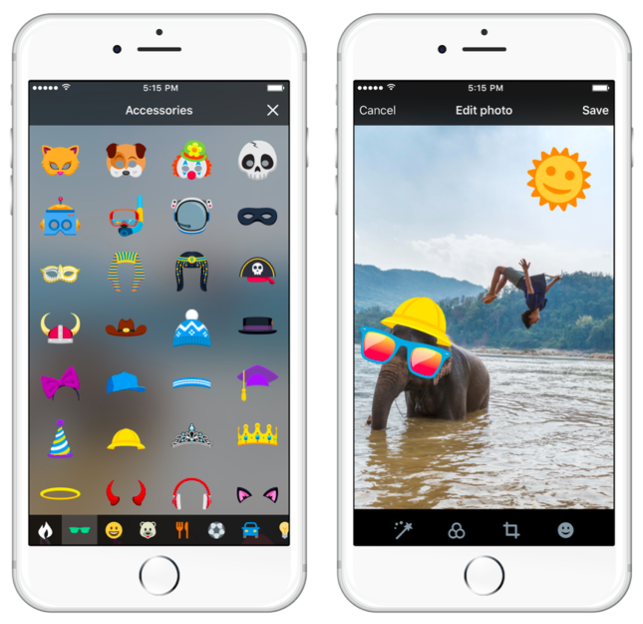 Stickers is another example of how Twitter is expanding its feature offerings in an effort to attract more users. Twitter also recently launched the ability for users to Retweet their own Tweets, and also has plans to make changes to the social network’s standard 140 character limit.